I’ve been waiting since last year to finally share this spinach clam soup with you guys. That’s because I can only find these cute wild baby clams during this time of year. If you had stopped by last night, you would have found us with our heads buried into a bucket of these garlic clams. This morning, I was at it again with the clam soup. Really, i can’t help myself ! 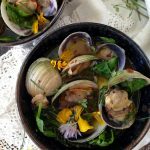 I wanted to make a healthy summery variation of clam soup, light and vibrant with lots of nutrition. Not to say that there’s anything wrong with a little indulgence in a bowl of comforting creamy clam chowder. But that’s something I crave once the weather cools off a little bit in the fall. 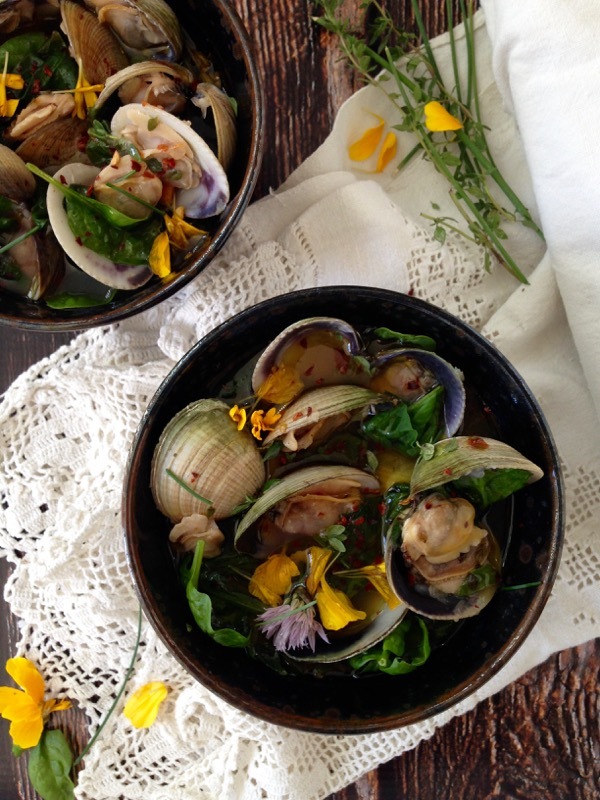 Back to my summery clam soup over here, it is just bursting with a medley of fresh flavors. I start the base with tons of garlic and a couple of anchovies melted in the olive oil, then i build on layers of flavors with some white wine, fresh tomatoes and finish with wilted baby spinach. Such a beauty, I swear ! I had some Sicilian oregano left in the pantry, which I swear totally makes this clam soup. Speaking of which, we will be in Sicilia in a few days, I am so giddy with excitement is not even funny. 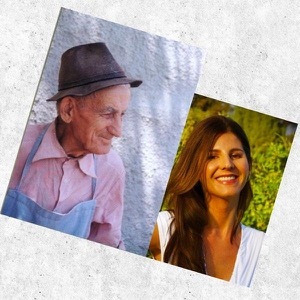 Not only because I’m gonna load up on more Sicilian oregano, but we are actually going on a real adventure, across the country side from Palermo to Taormina, just the two of us ! I planned for us to spend one night in seductive Palermo, you know, to set the stage for a romantic kiss on the rooftop of a hotel overlooking the aristocratic city. Then hop on a train to Taormina early in the morning, extra Cannoli in hand ! I really don’t know, but I decided I won’t schedule any blog posts for this period of time. I will of course share it all with you when we return, or from over there, If I do convince my man we need to stay… And then you can all book a room at our B & B and come sit under the Pergola with me, eat Cannoli and sip on espresso ! 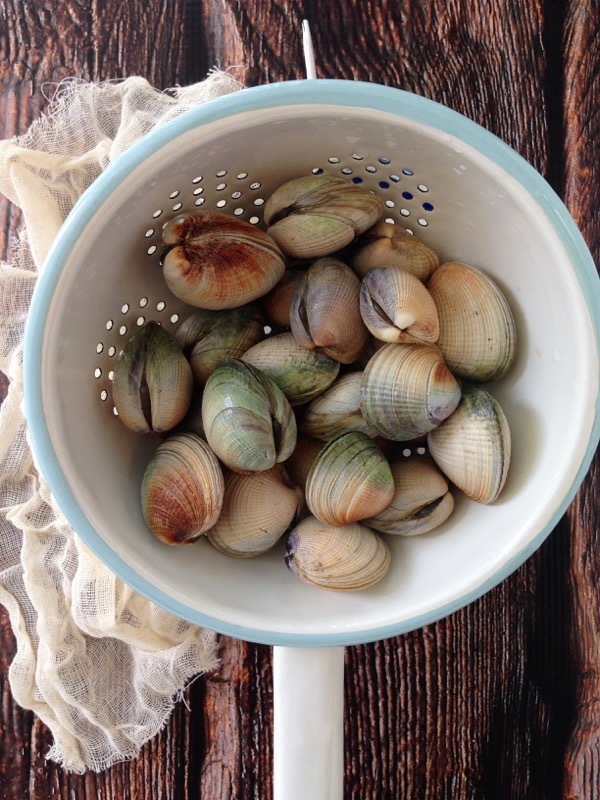 So tell me: have you ever made clam soup ? Most importantly have you ever been to Sicily ? If not, is Sicily on your bucket list ? Tell me ! In a heavy bottom soup pot heat up the olive oil and sautee the onion with a pinch of sea salt until traslucent. Add the anchovies and break them up with the side of a wooden spoon until disintegrated in the oil. Add the garlic, red pepper flakes, thyme and bay leaf to the pan and give it a good stir. Only cook for about 30 seconds until you can smell the garlic permeate your house. Hit it with the whit wine and oregano and bring to a simmer. Allow it to reduce by half before adding in the potatoes and the vegetable stock. Bring to a simmer and cook for about 5 minutes until the potatoes have softened. Add the wild clams and diced tomatoes, bring to a gentle simmer and cover with a lid. Cook for a few minutes until all the clams have opened. Turn off the flame and squeeze in the lemon juice. Adjust seasonings to your taste with more sea salt and add the baby spinach on top. Cover with a tight lid and allow the spinach to wilt for a few minutes from the steam of the soup. 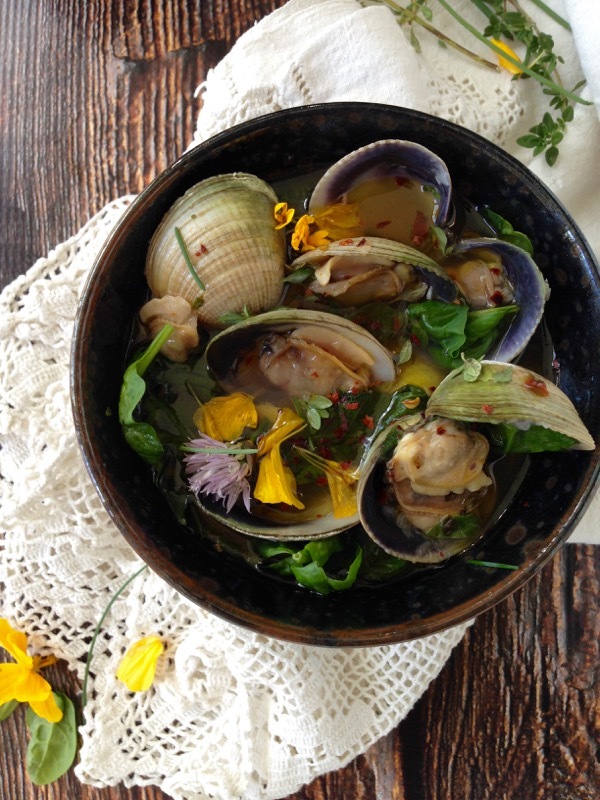 Ladle the clam soup into bowls and drizzle with a nice extra virgin olive oil over the top. Garnish with the edible flower petals and some chives. Serve with crusty bruschetta. Thank you, I sprinkle those petals over everyting lol Hope you are having a great week! The pictures are gorgeous, it almost looks as a painting! I’m pretty sure it tastes awesome! Pinned! So pretty!! I adore clams. I grew up with clam soup – miso soup actually! Always a concern when I travel too, will the iPhone make it through the day. LOL! I have never made clam soup, but do a mussel soup with similar flavours, totes a summer thing tho. Never been to Sicily, but it is ABSOLUTELY on the travel bucket list. Cant wait for posts about your travels and food you ate. I have been eyeing this recipe for quite some time, and I must give it a try this weekend! 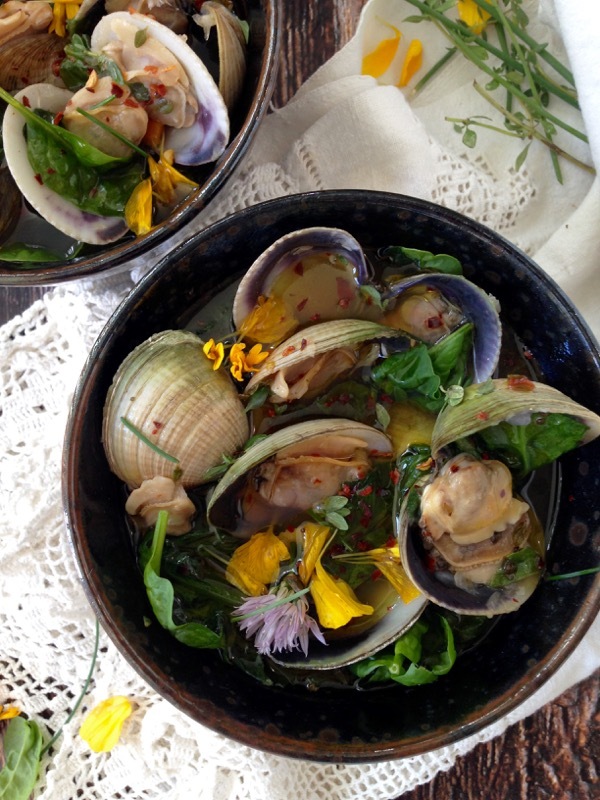 The clams look so perfect and I love the way you garnish your soups! pinned!